The item Ben and me, (electronic resource) represents a specific, individual, material embodiment of a distinct intellectual or artistic creation found in San Francisco Public Library. One snowy day in 1745, Amos the mouse leaves home for a better life. When he enters an old shop near the edge of town, Benjamin Franklin offers him a job! Right away, the small mouse begins to make a big difference as he helps with Ben's greatest discoveries: bifocal glasses, a stove, electricity, and more! But when tensions run high between the two friends, Amos leaves Ben's workshop. Can Ben succeed without his mouse friend? Or, years later, will the fate of the 13 colonies be at stake without the little mouse's wisdom? 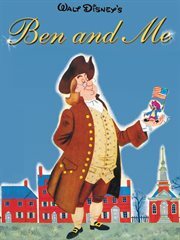 Don't miss this charming retelling of the life of Benjamin Franklin-with a Disney twist!